With the Camera tool, you can pan/zoom/rotate each morphing frame through a customized track. This makes it possible to set a moving viewpoint to see the morphing process. Choose the Sequence/Camera menu to open the Camera window below. You can also use Camera to make movie/sequence effects animated. 1. You can edit and preview the Camera in the workspace ( ). The camera is specified by a sequence of control points and smoothly passes through each point in the sequence, just like the Track Curve. See more about "How to Use Track". 2. 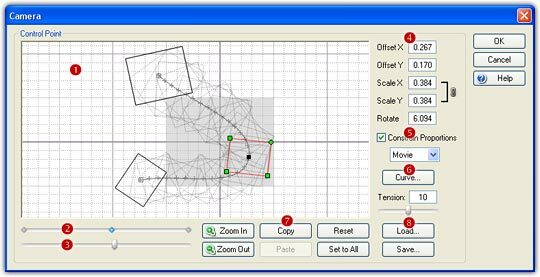 Each control point defines a key frame with a group of offset/scale/rotate status, and all other frames will be automatically calculated according to the key frames. You can find the relative position of the control points on the ruler ( ), click a point on the ruler or directly click a key frame on the workspace to start to edit it. 3. Drag the preview slider ( ) to preview the camera track, you can preview the final morph on the main interface synchronously. 4. You can zoom the workspace by using mouse wheel scrolling or clicking the Zoom In or Zoom Out button, and you can drag and drop to pan the workspace. 5. The gray rectangle region in the center of the workspace indicates the movie location. Drag anywhere inside a key frame to move it, drag any of the 3 square handles to resize the frame, and drag the circle handle to rotate the frame. The actual offset/scale/rotate parameters ( ) will be calculated automatically while dragging. You can also type the desired parameters manually. Note, a negative ScaleX will result in a horizontal flip, and a negative ScaleY will result in a vertical flip. 6. You can use the Constrain Proportions option ( ) to set the proportion of a key frame to be the same as Movie, Image 1 or Image 2. If this option is unchecked, you can set an arbitrary proportion for the key frame. 7. Choose a Curve button ( ) to set a curve for camera track. This will result in a nonlinear camera track. 8. You can use the Copy and Paste button ( ) to copy the current status parameters and then paste to other key frame. Click the Reset button to clear the current settings and back to the original status. Click the Set to All button to apply this camera to all sequences in the current project. 9. You can the Load and Save button ( ) to save the current camera to load it later. You can set different camera for each sequence in a project. You can edit the camera while the morph movie is playing, which means you will immediately see the effects on your final morph. Camera is only available in FantaMorph Deluxe.